I’m delighted to have an interview about my music and Climate Justice in EYCE’s (Ecumenical Youth Council In Europe) LEAF magazine. Have a read of it on page 13. The questions were quite challenging, which is a great thing. Thanks to Catharina Covolo for the Interview. So the new Album has been mastered and I can’t wait to get it out into the world, but I’m gonna give three free tracks away before Christmas and I’ll be releasing it in the new year. 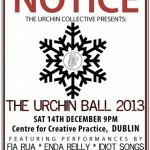 Notes: The Urchin Ball features music from Idiot Songs, Fia Rua and Enda Reilly. Come on down for a great night of ceol and craic. Here’s a a video of a song called Baby’s In Black , which I’ve been working on for the Dublin Beatles Festival. It runs from Thursday to Sunday and I’ll be playing on Thursday in the Gresham Hotel and The Oval at 9.30pm,( where John and Ringo had a pint) and on Saturday in The grand Social at 2pm and Filmbase at 3pm. There’s loads going on between bands and plays and Yellow Submarines and all the rest. Enjoy and Share if you like it. Bhí comhrá deas agam le Cormac O hEadhra Agus Órla nic Shuibhne cúpla Seachtain ó shin do gclár Gaol Gairid. Chraolfar inniú ag 4.15pm ar Raidió Na Gaeltachta é. 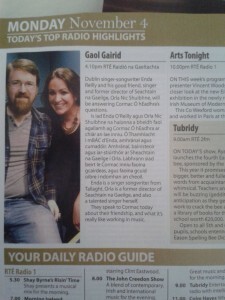 So I had a great chat and a bit of craic with Órla nic Shuibhne and Cormac O hEadhra on Gail Gairid a show on RTÉ RNaG, Ireland’s national Irish Language radio station. It airs today at 4.15pm. And it was nice to get into the RTE Guide magazine too.